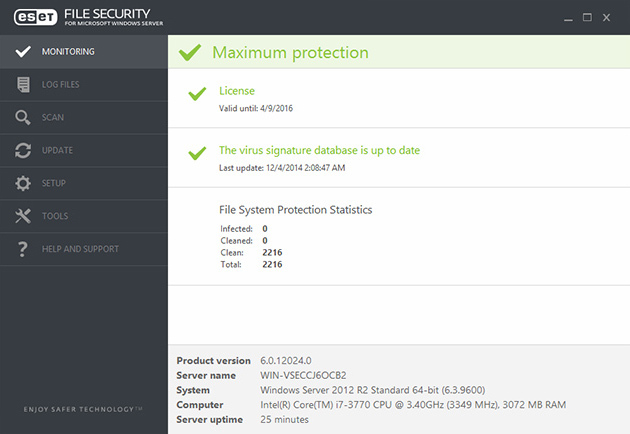 Cross-platform anti-malware protection against shared-file and host-system infection. ESET File Security for Microsoft Windows® Server provides superior protection for your company’s data passing through the file server. The solution utilises the proven ESET NOD32® scanning engine at its core and combines high detection speed, smooth performance, and stability to ensure a continuously high level of security. Maintain more memory and CPU power for critical system tasks thanks to the solution’s minimal resource usage. Stay on top of server security with detailed and comprehensive security logs, vital protection status information and system notifications. Proven ESET NOD32® Technology Working for You. With Exploit Blocker and Advanced Memory Scanner to neutralise sophisticated threats. Meets the Needs of Complex Network Infrastructure. Optimised for virtual environments, with native clustering support and storage scan.